New book, 120 pages, 275 colour photos. The first in this new series covers building and finishing 1/72 scale model aircraft. The author Libor Jekl, is a modeller right at the top of his game with the ability to share his techniques and demystify the more complex processes of advanced model construction. Step-by-step images take the modeller through each process and explain in simple stages how to tackle modelling tasks that can baffle the most experienced of us. 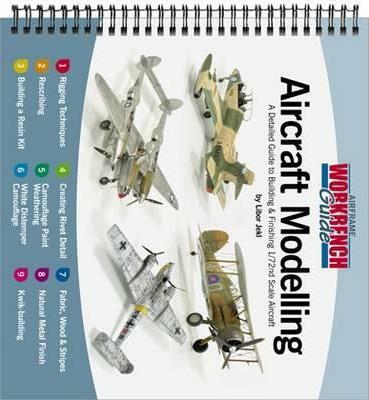 New Format Airframe Workbench Guides are designed to be used at a modelling workstation. Produced in a square format in full colour throughout, each guide is wire bound with text pages protected by laminated covers so that it can be used again and again. Within 120 pages, Libor covers the following topics: Rigging techniques, Rescribing, Building a Resin Kit, Creating Rivet Detail, Camouflage Paint Weathering, White Distemper Camouflage, Fabric, Wood and Stripes, Natural Metal Finish, Kwik-building.